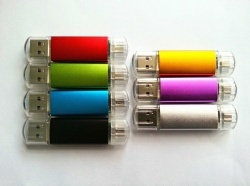 We have a TON of different USB drives to offer. Only a couple are shown here because there are simply too many types available for us to show them all. Tell us what you're looking for as it's nearly guaranteed we'll have the type of drive you're looking for. One of the most frequently sought after drives are custom laser printed swivel drives. We offer those with in-house laser printing for super fast turnarounds. Ask your sales representative about these products that really make your company look good! These drives were ordered for a customer and loaded with data. The customer then found they were not the size they needed. The drives have been reformatted to remove the customer's data. The drives are "like new" but are not new because of this copy/format. It makes for a really great deal for someone! 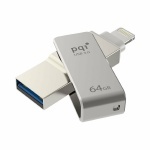 CDS8GBPTNC 8GB USB flash drive with silver/white body and cap. Bulk packaging. These drives were ordered for a customer and loaded with data. The customer then found they were not the size they needed. The drives have been reformatted to remove the customer's data. The drives are "like new" but are not new because of this copy/format. It makes for a really great deal for someone! CDS16GBWDLE-B 16GB wooden body USB flash drive with magnetic cap. Price includes one-sided laser engraving. iConnect-Mini-16 The iConnect Mini offers 1-touch photo and video back-up for iPhones, iPads, and iPods with a Lightning connection. In addition, the iConnect Mini has a dual Lightning and USB3.0 connection allowing it to work as a portable media library, storing a whole collection of music, movies, videos, and even data files like pdf, that can be played directly through any Apple device with the Lightning connection or any computer with a USB connection. iConnect-Mini-32 The iConnect Mini offers 1-touch photo and video back-up for iPhones, iPads, and iPods with a Lightning connection. In addition, the iConnect Mini has a dual Lightning and USB3.0 connection allowing it to work as a portable media library, storing a whole collection of music, movies, videos, and even data files like pdf, that can be played directly through any Apple device with the Lightning connection or any computer with a USB connection. iConnect-Mini-64 The iConnect Mini offers 1-touch photo and video back-up for iPhones, iPads, and iPods with a Lightning connection. In addition, the iConnect Mini has a dual Lightning and USB3.0 connection allowing it to work as a portable media library, storing a whole collection of music, movies, videos, and even data files like pdf, that can be played directly through any Apple device with the Lightning connection or any computer with a USB connection. iConnect-Mini-128 The iConnect Mini offers 1-touch photo and video back-up for iPhones, iPads, and iPods with a Lightning connection. 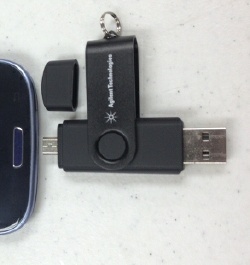 In addition, the iConnect Mini has a dual Lightning and USB3.0 connection allowing it to work as a portable media library, storing a whole collection of music, movies, videos, and even data files like pdf, that can be played directly through any Apple device with the Lightning connection or any computer with a USB connection.